Our three newest officers, Trenent Hantz, Anthony Vittone and Karissa Grossman completedtheir Oath of Honor recently. 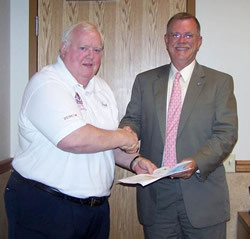 The oath was administered by Mayor Scott Walker at a recent Somerset Borough Council meeting. 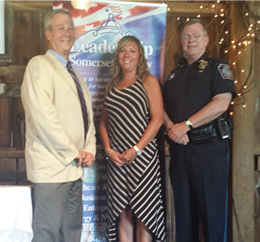 Congratulations to Officer Hemminger, the first police officer to have participated in Leadership Somerset County. 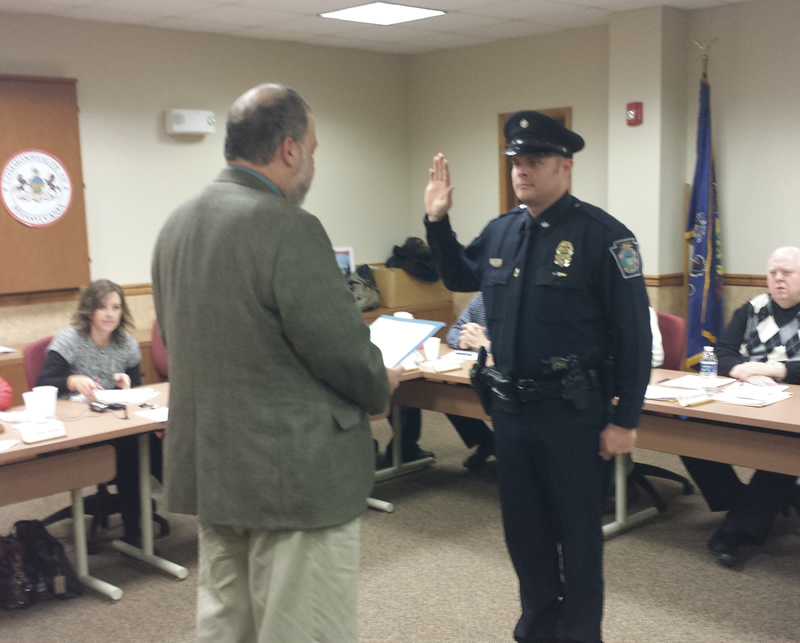 Mayor Scott Walker swears in new officer Jason M. Upton at the November 24th Council Meeting. 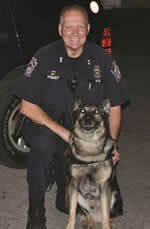 Upton is a graduate of the IUP Regional Police Academy and holds degrees from Geneva College (MS in Organizational Leadership), The Community College of the Air Force (AS in Criminal Justice), Penn State (Arts & Sciences) and Indiana Bible College (Liberal Studies). Ajay, the new Somerset Borough police K-9 officer, and his handler, officer Brian Harbart, perform a swearing-in ceremony Monday before Borough Council. Thomas Slusser Jeff Keafer (second from left), a corrections officer at State Correctional Institution-Somerset, is congratulated by Somerset Borough police Officer Christopher Pile after receiving a commendation for helping Pile when a suspect he was arresting fought him. 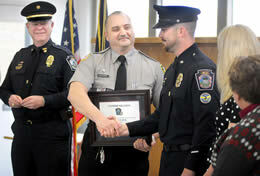 Officials on Tuesday praised corrections officer Jeff Keefer, who went to the assistance of Somerset Borough police Officer Chris Pile when Pile was in an altercation with the driver of a stolen car. A data collection website has released a report naming Somerset the 39th best small city in the United States for police officers to work and live. The officers and staff of the Somerset Borough Police Department mourn the line of duty death of St. Clair Township Police Officer Lloyd E. “Jr.” Reed, Jr.
St. Peter's Catholic Schools 5th grade class recently became D.A.R.E. graduates. Borough's Council at the recent meeting. As we welcome Ajay, let us pause to remember K9 Arny who paved the way. Click here to see more about Arny. Somerset Hospital emergency room registered nurse Amy Handwerk controlling an unruly patient, portrayed by registered nurse James Burkholder as Somerset Borough Police Sgt. 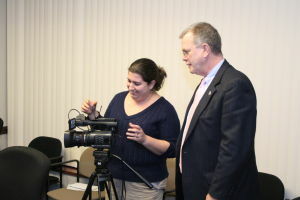 Stephen Borosky gives direction at a training held on April 15. End of Watch: Tuesday, May 5, 2015. 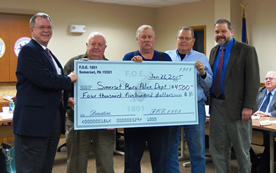 The Fraternal Order of Eagles, Aerie 1801, recently presented the Somerset Borough Police Department with a gift of $4,500.00 toward the purchase of video cameras for use by the department’s officers during the normal course of their duties. Sgt. Rich Appel, SPD’s D.A.R.E. 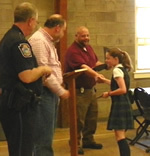 Officer, looks over thank you cards recently received from the 5th Grade class at St. Peter’s School. In acknowledgment of the respect and affection shown to Arny by the community, the Somerset Borough Police Department wishes to invite the community to attend a memorial service for Arny. At Somerset Borough Council’s February meeting, Altoona pet artist Rachel DiAndrea presented an original watercolor painting of Somerset Borough Police Department K-9 Officer Arny. The police dog, who has been on duty since 2006, was forced into retirement due to an aggressive form of cancer. On behalf of the Somerset Police K9 Officer Brian Harbart and his family, Chief Randy Cox wants to thank the Somerset Community for the outpouring of sympathy and support received in the wake of the news that the department’s K9, Arny, is suffering from terminal cancer. Somerset Borough Police are currently investigating what may possibly be related to transient criminal activity. Police began receiving calls concerning young men going door to door selling magazine subscriptions. Somerset County residents now have a safe way to dispose of old medications year-round. Somerset County District Attorney Lisa Lazzari-Strasiser and Somerset Borough police Chief Randy Cox unveiled a PA MedReturn box Monday. Residents gathered Tuesday night at the Union Street Playground to enjoy Somerset Night Out. The annual event is held to promote crime and drug awareness. The event includes free crafts and activities for families sponsored by local community groups such as the Learning Lamp and the Boys & Girls Club of Somerset County. The officers and staff of the Somerset Borough Police Department mourn the line of duty death of Perryopolis Borough Police Officer Richard Champion. DARE is an exciting 9 Week program for school aged students grades K through 12 that helps students resist pressures that may influence them to experiment with alcohol, tobacco, marijuana, inhalants and other drugs. Cox was the guest on the January edition of “DA Live,” a monthly online feature on dailyamerican.com. The last time the Somerset County 911 radio system was updated was in the late ’90s, according to Somerset Borough Police Chief Randy Cox. James Hahn, a deputy coroner and retired Somerset Borough police officer, was traveling to a funeral in Rockwood Wednesday morning when he was killed in a two-vehicle accident. 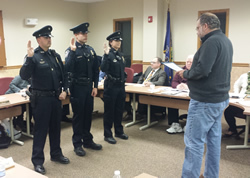 The Somerset Borough Police Department promoted two officers to sergeants on Monday night. Richard Appel and Stephen Borosky were appointed to the rank by Somerset Borough Council. Somerset's borough police force is updating its motorcycle corps thanks to the support of three Somerset veterans organizations. The department is replacing its 2007 Harley-Davidson with two 2-year-old Harley Electra Glide motorcycles. A police officer is now monitoring the halls of the Somerset Area School District. Somerset Borough police Chief Randy Cox told council members during Monday's meeting that the officer-in-school program is being implemented successfully. The program started Thursday. 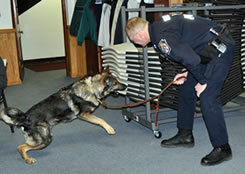 A police dog is a powerful weapon to be handled with care, according to Somerset Borough K-9 Handler Brian Harbart. The Pittsburgh Zoo & PPG Aquarium brought a world-renowned expert to the International Conversation Center Thursday to conduct a training seminar for guard dogs at the elephant breeding facility, located near Fairhope. Somerset Borough police Officer Brian Harbart and his K-9 partner, Arny, were recognized at Tuesday's Somerset County Prison Board meeting. SOMERSET NIGHT OUT COMMUNITY BLOCK PARTY! When presented with an opportunity for SPD officers to attend one of the premier police administration training programs available for law enforcement, there was only one obstacle… paying the tuition. Although there were no students at the Somerset middle and high school Monday, lessons were still being learned. The day before school was used for a drill involving local police, first responders and school personnel. Somerset Borough Mayor William Meyer's 16th year in office will be his last. "It's been a privilege to serve the people of Somerset Borough," he said. "The time has come to move on." Meyer, 81, said he will not run for re-election. His term ends at the end of the year. A company named Team Spirit Promotions has recently been engaging in a telemarketing campaign in the Somerset area to sell ad space on a refrigerator magnet they plan to distribute in Somerset. 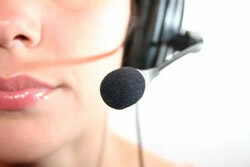 The telemarketers have been falsely representing that the Somerset Borough Police Department. 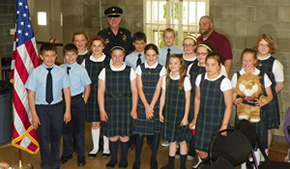 St. Peter's 5th grade class. On Friday, February 24, 2012, the Somerset Borough Police department was shocked and saddened to learn that one of its officers had been arrested on bribery charges. The officer had solicited a payment of $500.00 from a young man found to be in possession of a small amount of marijuana. In return for the payment the officer had volunteered not to initiate a criminal prosecution of the man. Jason Ponczek, an officer of the Somerset Borough Police Department was placed under arrest Friday evening, February 24th, 2012 for bribery related charges by the Pennsylvania State Police. The Somerset Borough Police Department greets this news with both shock and sadness. Somerset Borough Mayor William Meyer and Manager Benedict G. Vinzani Jr. announces that the borough is providing "No Solicitors or Peddlers" stickers for use on borough residents' doors. WELCOME TO THE 28th ANNIVERSARY AND SOMERSET'S 16th ANNUAL SOMERSET NIGHT OUT COMMUNITY BLOCK PARTY! Coordinated by the Somerset Borough Police Department and the Village of Somerset. 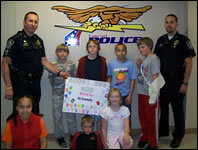 EOW: Monday, December 19, 2011. More information may be found at the Officer Down Memorial Page. Since joining the force six years ago, Somerset Borough’s four-legged officer has proved he is not your average “K-9.” This year alone Arny has been used in 10 building searches, four vehicle searches, one tracking and one aggression to bring down someone resisting arrest. The public may now submit anonymous tips through the same website, where people and the news media will be able to read police activity reports. Domestic violence calls are a perennial law enforcement issue and Somerset Borough has a new tool to help stop the abuse. There are now nine child passenger safety technicians in Somerset County to inspect car seats. “We’re thrilled to have a Safe Kids Chapter,” said Pam O’Kinsky, a local Citizens Advisory Board member for the Pennsylvania Department of Transpiration. WELCOME TO THE 27th ANNIVERSARY AND SOMERSET'S 15th ANNUAL SOMERSET NIGHT OUT COMMUNITY BLOCK PARTY! Bikers will take to the road Sunday for Camp Cadet of Somerset County’s annual motorcycle run. Shade-Central City senior Jeremy Nicholas shared stories with the public Wednesday about his adolescent drug and alcohol use. Police in Somerset Borough are among a chosen few. The department recently was awarded accredited status by the Pennsylvania Law Enforcement Accreditation Commission. It is the only police department in Somerset and Cambria counties to obtain accreditation, said Richard Hammon, accreditation project coordinator for the state Chiefs of Police Association in Harrisburg. WELCOME TO THE 26th ANNIVERSARY AND SOMERSET’S 14th ANNUAL SOMERSET NIGHT OUT COMMUNITY BLOCK PARTY! “Good morning,” Somerset Borough Police Officer Charlie Santa greeted students arriving at Maple Ridge elementary Wednesday morning. As more local police officers prepare to participate in crisis intervention training, police and members of the mental health community said those trained are benefiting the region. Why don't abuse witnesses speak up? Driving through the borough – day or night – the police officers are hard to miss. 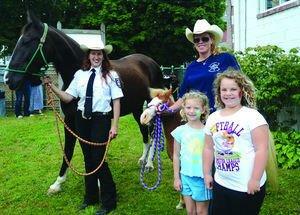 Somerset's Night Out drew a nice crowd, even though a late afternoon rain threatened to derail the event Tuesday. At a media event Friday in the Somerset County Office Building's rotunda, Somerset Borough police Chief Randy Cox explained that Somerset County DUI Task Force members will operate checkpoints regionally, using more than a dozen local officers to work the checkpoints. Six people helped local police by having a few drinks Wednesday. Clifford Pile, a veteran Somerset Borough police officer, died Saturday morning of cancer. Somerset could have suffered a grotesque tragedy on October 8th, 2006, had it not been for the calm, collected and effective reaction of three Somerset Borough Police Officers. It’s a night in Somerset Borough, with Officers Michael Gray and David Deist on the job. A report comes in about a possible assault on East Patriot Street. Gray, a five-year veteran, and Deist, a 22-year veteran, respond to the house, where one man was reported to have assaulted another. With an expanded police force, borough police Chief Randy Cox said the department is sharpening its focus on traffic patrol and halting drug trafficking. “When you’re stretched too thin, you don’t have time to do the basics,” Cox said. Officer Tony Novak and the Somerset Borough Police Department collected water for the victims of Hurricane Katrina on Sept 17. After 41 years in law enforcement, officer James Hahn has become a guiding force. 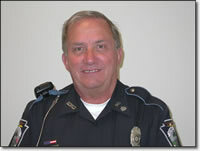 Clifford Pile, officer in charge, retired June 21. We would like to thank all the people that helped to make this a great success!